The View Through Your Earpiece: Guest Bloggers Galore! I'm still furious the Islanders sent Nino Niederreiter back to juniors. As a season ticket holder and someone who will watch almost all 82-games this season, the Isles product was better with Niederreiter on the ice. Since the Isles sent Niederreiter back to juniors after his nine game test run, the Isles have gone 0-3, losing a combined 16 to 4 in those three games. Sure, the Isles have lost the last five games they’ve played, but with El Nino in the lineup for the first two losses of this Islanders’ five-game losing streak, the team lost a one-goal game to Florida on October 23rd and a close one in Montreal, 5-3 on October 27th. Andrei Kostitsyn scored an empty net goal for the Habs, otherwise it would have been a one-goal game, as well. I’m not saying El Nino would have made an overwhelming offensive impact. He scored a goal and an assist in his first 9 NHL games, but you could see him progressing with each game. One of the last images I have of El Nino playing was watching him back-check and breaking up a play with a diving attempt. I miss that. I want to see more of that hustle and defensive responsibility from the rest of the team. The Isles talked about depth at forward as a reason it made sense not to rush El Nino along. Well, Bruno Gervais played forward against Montreal on Saturday night (as a 7th defenseman) and last night, Rob Schremp, centered the third line. Schremp's contribution: a -4 rating, a bad boarding penalty, and a secondary assist on a play Blake Comeau and PA Parenteau did all the work. Yes, I'm aware Kyle Okposo will be back, but then sit Hunter, send Sim to the minors, and only dress Gillies for games you know you need the muscle, such as the Flyers v. Isles game this coming Saturday. The most important thing people who believed sending El Nino back to Portland was the best decision are missing: team chemistry. There’s no stat for a player’s chemistry on and off the ice other than looking at wins and losses. The first nine games of the season, the Islanders were 4-3-2. Talent wise, let’s compare El Nino to the Isles beloved Trent Hunter. In 9 games this season, Hunter also has 2 points with no goals. Well, Hunter is a physical presence you say? Hunter has 13 hits in nine games, that’s three less than Niederreiter. Hunter has also taken careless penalties and has 21 total penalty minutes so far this season. At least Niederreiter has drawn two penalties this season to go with his PIMs. For those who ripped on El Nino’s .083 shooting percentage, it beats Comeau’s .081 and Frans Nielsen’s .071, as well as Hunter and Jon Sim’s .000. If Coach Gordon has to “baby” Niederreiter, that’s fine. His nickname El Nino means “the boy” in Spanish, not the man. So, if bringing Niederreiter along means starting him off on offensive zone face-offs, which in turns leads to Isles “W’s” I’m all for it. Baby him all you want. Maybe the strategy was actually working. For those who say, “try thinking long term,” I am. A day in the NHL is better than a day in juniors. Even if he’s not lighting up other teenagers, he’s gaining invaluable experience at the NHL level. If you want to talk about helping his confidence level, how does sending him back to Portland do that? It had to make him think his play wasn’t worthwhile on the current Isles team, which it was. 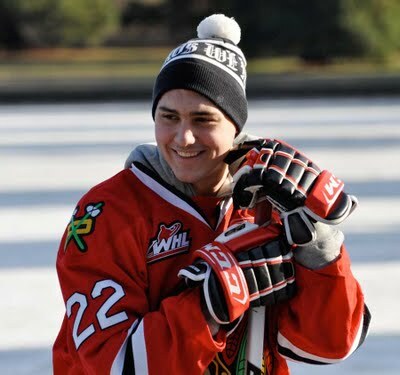 Lighhousehockey.com posted an interview Niederreiter did with a Swiss newspaper, 20 Minuten, with the emphasis being on Niederreiter saying, “I don’t belong there.” “There” meaning the “NHL.” Talk about a loss of confidence from a guy who proved he could play in the NHL. Question: Can you learn (how to be an NHL regular) in a junior league like the WHL? Niederreiter’s Answer: This question is justified. Usually, you always play at your opponent's level and in the WHL the level is lower than in the NHL. Therefore, despite weaker opponents, I am seeking to play like I did in the NHL. It's the only way to grow my play. He admits that the only way to become better is to play in the NHL, but has a great attitude, anyway. He appears to be a team player, not someone who should be living with a host family in Portland. Now, that’s really “babying” the guy. What I know: I wish Niederreiter was still playing for the big club. He showed early signs of his ability as a power forward and played a complete, solid two-way game. He fit in nicely on the Doug Weight and Michael Grabner line. It’s a shame he’s gone. I’ll be looking forward to El Nino’s return, next year.